We've been making some good progress through the Phenomenology - particularly the Reason section, whose second portion we're now working through. And, it's high time for another public online Q&A session. This time I wanted to give a bit of notice ahead of time, but as it turns out, it's today. . .
We're thinking, by the way, of moving away from Google Hangouts for hosting these sessions and towards a better platform - most likelyFreeConferenceCall.com, which we've used for other interactions, e.g. my online classes. In any case, later on today - 5-6 PM Central (i.e. 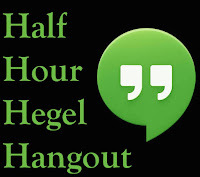 Chicago) Time, I'll be holding the Q&A session via Google Hangouts, as usual. I'll post the link for the Hangout once it's opened in several locations - my Patreon page, my Facebook author page, in Google+, and in Twitter. So, if you want to participate, you'll need to check at least one of those around the time the Hangout started. How Much Background Do You Need?